Forced to battle crumbling infrastructure and a constant churn of trends, sometimes the best way to save a foodservice operation is to change it entirely. As Steve Mangan, director of dining at the University of Michigan, puts it, “At some point when your building starts to fail, the cost of maintenance stands out.” But for operators with limited budgets, the challenge is discerning the right time to do so—and how far to take it. At Jefferson High School, change came because little worked anymore. The Cedar Rapids, Iowa, school’s cafeteria hadn’t been updated since 1957; students followed two long serving lines to a closed kitchen pumping out trays of premade food, and many were going off campus for lunch. “We were really struggling,” says Suzy Ketelsen, food and nutrition department manager for Cedar Rapids Community School District. Jefferson finally was able to upgrade that infrastructure, replacing the serving lines with five entree stations, a fruit and vegetable station and six cashier lines. Not only have the changes sped up dining services’ ability to serve students—about 400 in seven minutes—but the structure allows for the school to use more fresh produce. 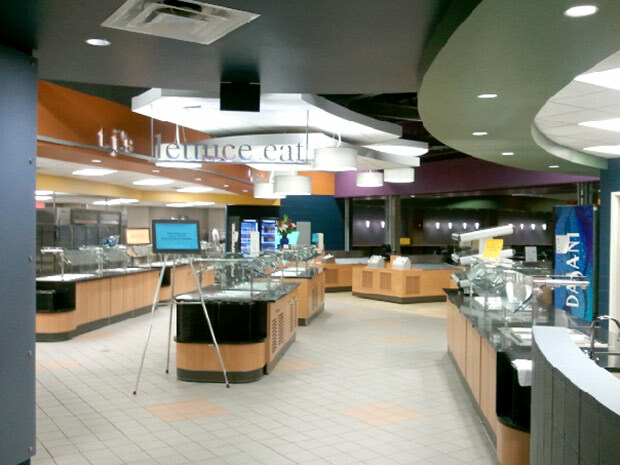 Like Jefferson, University of Michigan Dining leapt from “cook-and-park” stations to moveable kiosks for the award-winning 2015 redesign of its South Quad dining hall. Chefs now cook and plate on-site, offering trendy concepts like sushi and barbecue. “Scoop-and-serve dining doesn’t work for this generation,” Mangan says. That statement doesn’t just apply to younger diners. Habour’s Edge, a retirement community in Delray Beach, Fla., had the same idea when it undertook renovations last year, adding a fine-dining restaurant with a show kitchen where chefs cook and plate food a la minute. Harbour’s Edge Director of Culinary Services Tim D’Antuono says diners were looking for more of a restaurant atmosphere, while his cooking staff was able to recommend the right equipment. This kind of feedback was crucial to all three renovation projects, allowing Harbour’s Edge to make thorough upgrades and create fresh concepts.